Jetwerk is a social network for traveling professionals who want to maximize their time on the road and add the enjoyment of turning a missed opportunity into a planned get-together. How many times have you learned you were recently in the same city at the same time as a friend or business acquaintance and could have gotten together if you'd only known in advance? Jetwerk is a way to turn business-as-usual travel into an unexpected visit with a friend or dinner with current and future business partners. 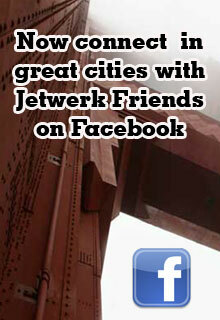 Jetwerk is a network of YOUR friends, business associates and family. You have the option to be as private or public as you want. You control who sees your trips, just a select few or the world. In this busy world, it's good to know that running into friends couldn't be easier. Let Jetwerk make your travel more enjoyable and more productive by cross-referencing your trips with friends, business associates and other Jetwerk members to meet new friends on the road. With Jetwerk, the arrival of your luggage and room service is no longer the highlight of your travel. Join today and start building your Jetwerk Network.